This third edition is a lively and provocative tract on how to teach mathematics in today's new world of online learning tools and innovative teaching devices. The author guides the reader through the joys and pitfalls of interacting with modern undergraduates—telling you very explicitly what to do and what not to do. This third edition has been streamlined from the second edition, but still includes the nuts and bolts of good teaching, discussing material related to new developments in teaching methodology and technique, as well as adding an entire new chapter on online teaching methods. Graduate students and researchers interested in improving their teaching of college mathematics. 'How to Teach Mathematics' is an excellent resource for anyone who teaches post-secondary mathematics. 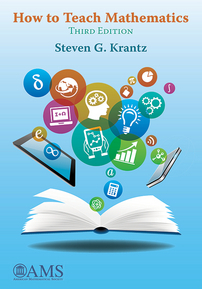 While the author, Steven G. Krantz, is a self-proclaimed traditionalist and much of the book is focused on lecturing, even the most ardent active learning proponent will find useful nuggets...The book is also a useful read for those who conduct research in undergraduate mathematics education because it provides insights and perspectives from a reflective mathematician...I feel comfortable recommending the book to anyone interested in mathematics teaching, especially at the undergraduate level...I think this book could play a helpful role in the ongoing conversations between mathematicians and mathematics educators regarding undergraduate mathematics instruction. The author guides the reader through the joys and pitfalls of interacting with modern undergraduates --- telling you very explicitly what to do and what not to do.